Tennis concentration is the ability to focus your mind on what’s important during the match to help you execute each shot well. Tennis players who concentrate well are aware of the ball, court, and their opponents only; they are able to block out distractions. A tennis player concentrating in the zone is able to filter out unnecessary noise and distractions. You focus only on the objectives to help you win points. How do you concentrative in tennis and cope with distractions? Begin by recalling your last match that you played well and had good levels of concentration. Compare this when you did not focus your best. Distractions can come from outside, from the environment – such as the weather conditions, wind, spectators, and so on. Distractions can also be internal – you alone produce the distraction – such as when you begin to think ahead in the match. Make a list of the top external and internal distractions that ruin your focus the most during matches. You want to know your enemy – your own distractions! This way you can learn to shut them down when they pop into your head during or between points. The most important step of improving your tennis concentration is the ability to refocus when you are distracted. You must be able to regain control of your concentration when it breaks down in the match. And it will break down at some point. If something disturbs you and causes you to lose focus, does this continue to affect you for the rest of the game or even the match? You want o learn how to refocus your mind as fast as you can. 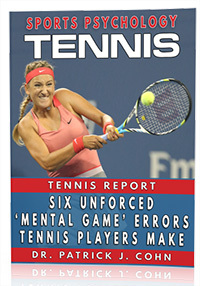 Top tennis players in the zone can re-focus within seconds or less. You too can learn how to do this! The secret to improved tennis concentration is a simple strategy I call, “The Three R’s”. 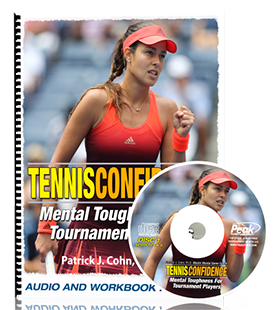 Anyone can use this key strategy to improve concentration in tennis and ultimately, achieve peak performance. Recognize – you can’t regain concentration without first recognizing that you have lost it. This is the first and vital step to refocusing! Regroup – once you notice that you are distracted, you need to break free from the distraction. Refocus – the most important step to regaining your focus. You must adjustment and get back to playing one point at a time.